One of Sean Walker’s primary goals was to earn an NCAA scholarship. But when the defenseman saw some of his junior hockey teammates receive those scholarships during the 2012-13 season, he worried he might be shut out. Then, Bowling Green became interested in the 5-foot-10, 194-pounder. The Falcons eventually offered him a scholarship, and he accepted. Since the start of last season, Walker has been one of BG’s best defensemen. He usually provides the team with solid defense, strong skating, smart plays and a physical presence, as he works on improving his offensive skills. Walker also kills penalties and blocks shots. Next up for Walker and the Falcons, 1-1 overall, is a trip to Alabama-Huntsville (0-2) on Friday and Saturday to begin Western Collegiate Hockey Association play. “Last year went really well,” said Walker, who came to BG after playing one season for the Newmarket Hurricanes in the Ontario Junior Hockey League. Newmarket is north of Toronto. Walker also entered the fall semester with a 3.0 grade-point average in business. Walker received little interest from U.S. college coaches when he was recruited two years. BG was the only school to offer him a scholarship. But Walker was only 18 at the time and could have played two more seasons of junior hockey. He wondered if most schools wanted him to play another season of juniors before offering him a scholarship, allowing him more time to develop. The Falcons, however, watched Walker play in late January 2013. He visited BG in late March 2013, and was offered a scholarship. He committed to the Falcons shortly after that. 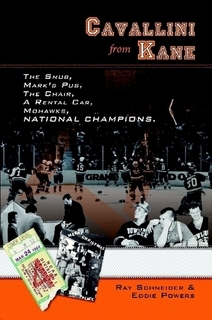 The Hurricanes finished second in their division that season and advanced to the finals of the league playoffs, losing the decisive game in the best-of-7 series by one goal. Walker had four goals, 24 assists and 103 penalty minutes in 77 games that season. Walker has been a regular on defense since arriving at BG. He also skated on the power play last season. 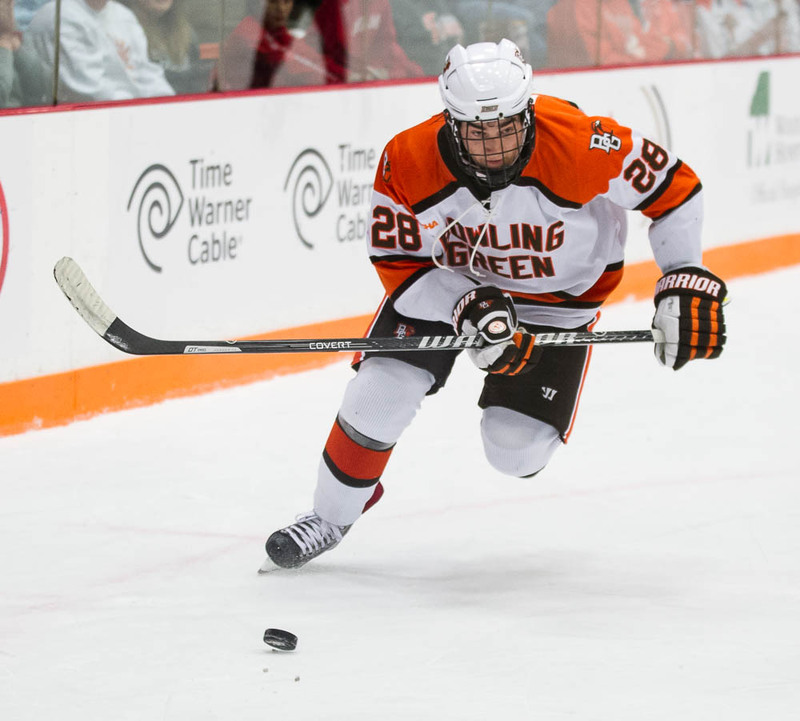 He played in 38 of BG’s 39 games, missing one game because of an automatic one-game suspension, the result of a game-disqualification penalty for contact to the head in just his seventh Falcon game. “When Sean got here last year, I’m not sure he realized how good he can be,” Falcon coach Chris Bergeron said. “There’s some offense there. He can defend. He has some pop to his game. There are layers to Sean. “He’s part of a leadership group. He’s learning the responsibility. He’s still got some development. He’s still got to take care of Sean and make sure he’s right every day. In addition to fine-tuning all parts of his game, Walker’s biggest task is to play well consistently. He had an on-ice rating of minus-1 in each game against Miami last weekend. A player receives a plus each time he is on the ice when his team scores and a minus each time he is on the ice when his team allows a goal. Power-play goals aren’t included. Walker’s skating enabled him to have a fairly smooth transition to college hockey. He easily could have been named to the WCHA’s all-rookie team, although he was left off the team. “I was a little bit nervous the first week (at BG), but once we got into a routine, and I got to know the guys well, everything went pretty well and I felt pretty comfortable pretty quickly,” Walker said. He also had 25 penalties for 75 minutes as he works to remain physical, while not taking bad penalties. “What we’re telling Sean is we’re not going to watch you be good,” Bergeron said. “We’re not going to watch you be OK. You’ve got a chance to be great, and it’s our responsibility to push you to that, and it’s your responsibility to be willing to that push. The undersized Walker — at least by hockey standards — has a chance to play pro hockey once he is finished with the Falcons. With the National Hockey League putting more of a premium on skating and skills, size is less of a factor in playing in the league.